DJI GO, iOSD, Zenmuse Z15-A7, 5D III, GH4, BMPCC, Ronin-MX, X3, X5, X5R, DJI propulsion systems, S900, S1000, S1000+, etc. 1.What is the difference between N3 and A3? Compatible Aircraft Fits any multi-rotor aircraft. Fits multi-rotor aircraft up generating moderate levels of vibrations. Main Controller Built-in industrial-grade sensors. Software dampening. Built-in consumer-grade sensors with redundant IMUs. Built-in physical dampeners. 1.What are the benefits of the N3’s IMU redundancy? IMU redundancy makes an entire flight system more reliable. IMU sensors are critical to the functioning of the flight controller so a failing IMU unit may cause unpredictable aircraft behavior. Redundancy means having a set of two IMUs, so in the unexpected event that one fails, the other will continue to function and ensure continued safe flight. 2.Does the N3 support the A3 Upgrade Kit? 3.What are the benefits of upgrading the N3 via the A3 Upgrade Kit? The upgraded N3 has an external IMU module which, combined with the dual IMU module inside the N3, creates a triple redundancy IMU system to significantly decrease the risk of IMU failure, increasing the reliability of the N3. 4.What is the main difference between the A3 Pro’s triple redundancy and that of the N3’s after mounting the A3 Upgrade Kit? When upgraded via the A3 Upgrade Kit, the N3 will have a total of two consumer-grade IMUs and one industrial-grade IMU, and two industrial-grade GPS modules. The A3 Pro has three industrial-grade IMUs and three industrial-grade GPS modules. 5.Can I use Pulse Position Modulation (PPM) receivers or Pulse Width Modulation (PWM) multichannel receivers? Yes, the N3 supports DJI Lightbridge 2, S-BUS and DJI DR16 receivers. Users who prefer either PPM or PWM receivers can change the port to S-BUS using a PWM adapter. 6.What kinds of receiver units are compatible with the N3? DJI Lightbridge 2, S-BUS and DJI DR16. 7.What types of DJI cameras and gimbals does the N3 support? The N3 is compatible with all Zenmuse Z3/X3/X5/X5R cameras and Z15 GH4/BMPCC/A7/5DIII and Ronin-MX gimbals. 8.Does the N3 support the iOSD Mini and iOSD Mark II? 9.Does the N3 support any third-party ESCs? The N3 is compatible with all standard 400Hz ESCs with 1520us center points. However, only DJI ESCs are able to offer feedback on voltage, current and motor speed. 10.What is the function of the iESC port on the N3’s main controller? How do I connect it to a DJI ESC? You can use the iESC port to connect the N3’s main controller to a DJI ESC for communication and upgrades. The communication function offers you ESC data, including motor speed, voltage and ESC error. The upgrade function updates the DJI ESCs firmware. With ESC adaptor cables you can connect up to 8 ESCs to the main controller. 11.How do I mount the IMU module and the N3 main controller to an airframe? Mount the IMU module and main controller as close to the aircraft’s gravitational center as possible. Keep away from other electronic devices, such as GPS modules, receivers, ESCs and motors. Make sure the IMU module is parallel to the airframe, pointing in the same direction as the nose of the aircraft. 12.Where should I mount the compass? Mount the compass on the airframe in a position away from metals and magnetic materials, such as the airframe itself and the motors. The compass pointer must be facing the same direction as the nose of the drone. 1.After updating the N3’s firmware, the LEDs are solid red. How do I fix this? A Red LED signal means that the main controller is locked following the firmware update. Click the unlock button to unlock the flight controller in DJI Assistant 2. 2.What should I do if the main controller fails to connect to DJI Assistant 2? d.	Use a different USB cable or USB port on your computer. 3.How do I use Intelligent Flight Modes when using an S-BUS controller? Currently, only Course Lock and Home Lock are available when using an S-BUS controller. To use these functions, you must set a three-way switch on the S-BUS controller as the Intelligent Flight Mode switch, corresponding Power, Home Lock and Course Lock respectively. 4.How many flight modes does the N3 support? 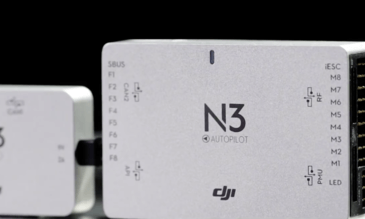 The N3 supports five flight modes: P (Position), A (Attitude), G (Gentle), S (Sport) and M (Manual). 5.What are the main differences between P, A, G, S and M modes as shown in DJI Assistant 2? M Mode: The aircraft can fly at any attitude angle. For experienced pilots only. 6.In Sport Mode, what is the N3’s maximum attitude angle? 7.In what instances will the N3 automatically shut down the aircraft’s motors? a. A motor is obstructed when flying near the ground. c.	The drone falls and turns on its side after taking off. 8.What can I do if my drone doesn’t take off after I pull down the control sticks on the controller? c.	Check that all ESCs are functioning properly, and that they are compatible with the N3. 9.Why did my drone turn over after take off? If your drone turns over, it could be due to incorrect setup or configuration of the system. Complete the following steps to correct any faults in setup. f.	Check that the drone is compatible with the N3. 10.How do I perform a multi-side IMU calibration? d.	When calibration is completed, you will need to restart the drone. 11.Will the N3 automatically change to Attitude mode if the compass experiences magnetic interference? The N3’s embedded software will self-correct when encountering problems caused by weak interference. However, when interference is strong enough to induce significant course deviations and the compass is not able to calculate the drone’s course precisely, the N3 will automatically change to Attitude mode. 12.My drone is flying off-course and is unable to hover precisely in P Mode. When hovering, it just circles around the positioning point. Why is this happening? The compass is probably not mounted correctly. Remount it and make sure that the compass point faces the same direction as the nose of the aircraft and re-calibrate it before use. 13.How do I resolve unexpected height drops when hovering with the N3? a. Keep the flight controller (where the barometer is built-in) away from propellers. b. Block all the ports of the flight controller with a sponge to stop air from getting in. 1.Does the N3 offer fault-tolerant control? d.	If the propeller system fails and the aircraft begins spinning, the N3 automatically enters Course Lock mode. 2.Can a drone take off without the N3 GPS module? 3.Is the N3 compatible with the Matrice 600? 4.Is the N3 main controller compatible with DJI SDK? Yes, it supports DJI Mobile and Onboard SDK. 5.What, if any, are the requirements for a drone’s motor axis distance when used with the N3? There is no required axis distance. However, if the aircraft generates a high level of vibrations we recommend that you use the A3 rather than the N3. We also strongly suggest maintaining a thrust-to-weight ratio (=thrust/weight) between 2 to 4. 6.What does it mean when the LEDs start flashing yellow three times in sequence? a．	The motors were mounted asymmetrically or in the wrong direction, or the propellers have been incorrectly paired with the motors. You can remove the propellers and mount them again. b．	The drone’s gravitational center is not in its geometric center. In this situation, you can manually adjust the gravitational center until it overlaps with the geometric center. c．	Too much shake is generated by the airframe. d．	The ratio of hover thrust to total propulsion is too low. Add more payload to the drone, or use a lower-powered propulsion system.